On September 7-8, the most grandiose event of this autumn took place in Kyiv – the 3rd Forum of Creative Industries, organized by Creativity Days Ukraine and ReklaMaster. Traditionally the Forum opens an entire series of interesting events, which together form a large-scale project called Days of Creativity in Ukraine. “Creativity these days is a key skill for leaders and companies that allows not only to adapt to change, but also to actively form new industries and markets, create new successful business projects. Ideas are becoming one of the main competitive advantages. This project brings together significant events and partners who take an active part in the development of Ukraine’s creative economy,” note the organizers. The most creative and intellectual crowd in the country gathered in NSC “Olimpiyskiy” to hear more than 100 amazing speakers from 13 industries from Ukraine and abroad. These were two days of discovery, inspiration and mutual enrichment, and the rich program of thematic blocks “Marketing and Communications”, “Startups and Technologies”, “Business and Innovation”, “Creativity and Design”, “Culture and Life”, “Society and State” gave everyone the opportunity to find their point of intersection between cultures and ideas, which would inspire them to a burst of creativity. The atmosphere of the Forum is as close as possible to the most famous international creativity festival Cannes Lions, and the main event of the first day of the Forum was the awarding of the Ukrainian creative agencies “Banda” and “Republique” with the Bronze Cannes Lion in the Design category, which they received for the branding of Eurovision 2017. For us it’s especially nice that the most prominent award in the world of creativity was awarded to our partners, since Banda Agency are the authors behind the series of 6 stylish, playfully provocative commercials for WHY NOT™ from New Products Group. Our company supported the Forum with its most creative and extraordinary product, a fundamentally new energy drink Green Energy™. After all, this unique energy drink with an extract of cannabis seeds is able to remove all blockades, stimulate your imagination and inspire something incredible. The drinks with non-narcotic cannabis are a rapidly growing trend in the United States and Western Europe among adherents of a healthy and active lifestyle. And the number one product in this new segment in Ukraine was the energy drink Green Energy™, in which all useful properties of the plant are preserved to the max! “New Products Group can not stand to the side when such interesting events as the Forum of Creative Industries are happening. Nowadays, all the most impressive and innovative world-changing discoveries are made at the intersection of ideas, concepts and cultures. The Forum is that point of intersection, and perhaps even the cradle of brilliant ideas that will determine our future – no matter how lofty it may sound. At the same time, the atmosphere at the Forum is easy, relaxed, emphatically creative. It perfectly fits Green Energy™ – the energy drink that can expand the boundaries of your mind and push it to a creative explosion,” – comments Elena Selutina, PR Director of New Products Group. 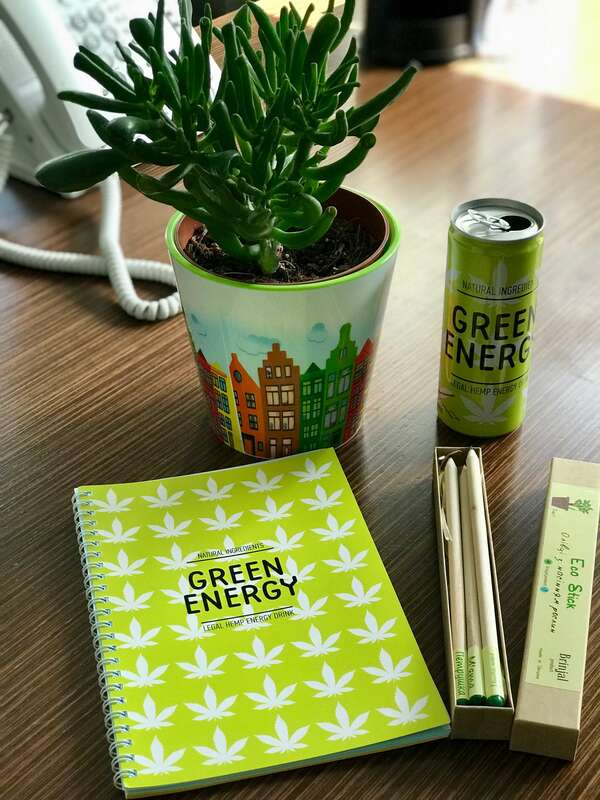 The speakers at the Forum received creative gifts from Green Energy™, in particular notebooks for making creative notes and a set of graphite pencils Eco Stick, from which you can… grow a plant. The Days of Creativity in Ukraine continue – still ahead is a week of screenings for Cannes Lions masterpieces, “Battle of Agencies”, the Young Creator Competition and many other interesting events.